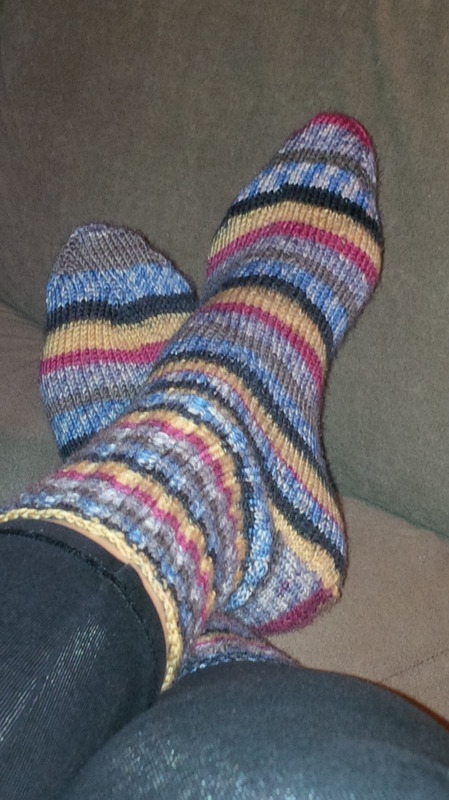 I am kicking off the new year with these socks that I finished on New Years Eve day. These socks are a wool cashmere blend and are pure luxury on my feet. These are the first pair of hand knit socks that I have worn and had I known how wonderful handknit socks would feel I would have made myself some long ago. Sasha is begging for a matching pair because he out grew the ones I made him last year. As I was knitting them he kept telling me that pink is a boy colour too, so he would like a matching pair in his size. I think all along that he knew how comfy they were, and doesn’t care what they look like. The only downside is that they are SUPER slippery on our hardwood floors, so the next post might be that I have broken my leg wearing my wonderful socks, fingers crossed that I maintain upright walking posture. I started knitting just over a year ago, and it’s fair to say that I am now an intermediate knitter. I haven’t attempted cables or much multi-colour pattern work nor do I have interest in doing so. So I am thinking that it might be time for a new hobby… It’s the new year and I need a new crafting hobby. I am thinking that I will learn how to crochet this year, it’s not that much of stretch from knitting but I already have the supplies. I will keep you posted on my progress.